Today’s healthcare systems are effectively ‘sickness services’ oriented more towards treating the sick than preventing disease. Worse still, health systems can encourage reliance and complacency towards one’s own health. 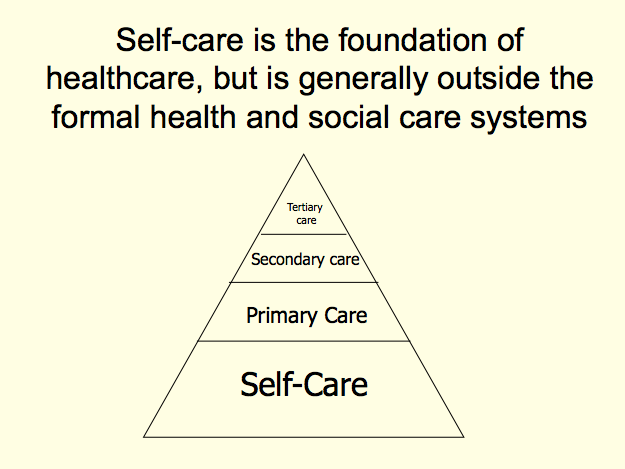 Self-care is the foundation of healthcare, but it occurs largely outside formal health and social systems, making it harder for governments to engage in and support. Self-care can be supported at many different levels – in the family, in the community, in companies or cities, but currently there is little connection or integration. The individual elements of self-care are simple in concept and some are even commonsensical, but they should be approached in an integrated and holistic manner. By contrast, Western approaches tend to target one problem at a time. There is much interest and support in the individual elements of self-care, but no natural champions covering the entire self-care space. Taking all of this together, it is apparent that while the threats of lifestyle diseases are massive, the challenges of adopting self-care are also massive.